The Single Action Shooting Society Congratulates World Championship Winners Jim Finch, Terri Galpin, Chance Koch and Heather Kresser. FOUNDERS RANCH, EDGEWOOD, NM. 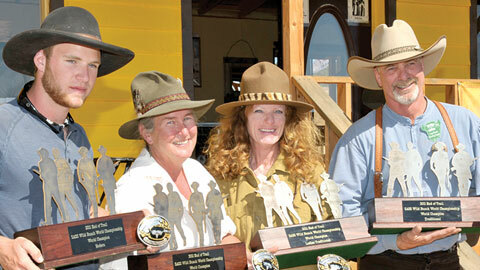 The 3rd annual World Championship of Wild Bunch Action Shooting® shook things up during the 30th annual End of Trail. The Single Action Shooting Society send its congratulations to the World Champions outlined below. Chance Koch, aka Last Chance Morales, SASS# 67180 of Redmond, Oregon proved his grit at the age of 17 during End of Trail, earning his World Champion finish shooting in the Wild Bunch Modern category. Chance began shooting Cowboy Action Shooting at the age of 12 and has been shooting Wild Bunch since its inception. Armed with a 1911 STI by PARA Ordinance, an 1873 Winchester Rifle by Navy Arms, and an 1897 Winchester Pump Shotgun, Chance over took the legendary Evil Roy to claim his first World Championship title and become the Top Overall finisher. Jim Finch, aka Long Hunter, SASS# 20389 of Amarillo, TX earned his World Champion finish shooting in the Wild Bunch Traditional category at End of Trail. SASS Wild Bunch and Cowboy Action Shooter Long Hunter headed into the final stage of shooting with an astounding 22.23 seconds lead from his closest competitor, despite the strong competition from the lineup of international shooters. Long Hunter took stage 12 in 39.05 seconds, resulting in a phenomenal rank points win. Long Hunter put in an impressive performance at End of Trail, later in the week also claiming a World Champion 49er title in the World Championship of Cowboy Action Shooting. The SASS Wild Bunch PARA 1911 was the handgun of choice for Long Hunter as he put in an impressive performance at End of Trail, along with a 1873 Winchester Rifle, and a 1897 Winchester Pump Shotgun. Terri Galpin, aka Texas Tiger, SASS# 74829 of Tijeras, NM earned her World Champion finish shooting in the Wild Bunch Ladies Traditional category at End of Trail. SASS Wild Bunch and Cowboy Action Shooter Texas Tiger maintained an impressive lead throughout the match, finishing an astounding 362 rank points ahead of her competition. Going on to also place 3rd in the Ladies Wrangler Category in the World Championship of Cowboy Action Shooting, Texas Tiger is true competitor and performer in shooting sports. Heather Kresser, aka Half-A-Hand Henri, SASS# 9727 of Magdalena, NM took home the World Champion Wild Bunch Ladies Modern title this year at End of Trail. A proven winner and competitor in Wild Bunch and Cowboy Action Shooting, Half-A-Hand Henri beat out the competition by a staggering 172 rank points in the World Championship of Wild Bunch Action Shooting. She also later in the week went on to claim an additional trophy as the World Champion Classic Cowgirl in the World Championship of Cowboy Action Shooting. The 3rd annual World Championship of Wild Bunch Action Shooting® was held in conjunction with the 30th World Championship of Cowboy Action Shooting and SASS Mounted Shooting at Founders Ranch in Edgewood, NM. Wild Bunch Action Shooting®, quickly gaining in popularity, continues to pick up speed and is regarded as the “Hottest Game” around. A combination of SASS Cowboy Action Shooting and Action Shooting with 1911 Pistols, the sport uses 1911 Pistols, Lever Action Rifles, and 1897 Pump Shotguns. Range set-up is comparable to a normal Cowboy Action Shooting Match. SASS Wild Bunch Action Shooting® is now sanctioning matches around the country.